Performance appraisal is the process of evaluating and documenting an employee’s performance with a view to enhancing work quality, output and efficiency. Performance appraisals perform three important functions within companies. They provide feedback to a person on their overall contribution for a period. They identify development needs and opportunities for improvement. They help inform salary and bonus reviews. What Are The 6 Steps To A Successful Performance Appraisal? what competencies (knowledge, skills and abilities) are required. It is also important to help staff take a step back to look at their past performance. what results have they produced? how have they behaved with customers, suppliers, colleagues, and supervisors? how have they demonstrated the organisation’s values? have they followed process and procedures? what has been their biggest challenges? how will they adapt to any changes ahead? Employee goals will usually focus on an aspect of their performance they want to work on or be better at. Goals may also reflect the employee’s ambitions for their career. A manager’s role will be to ensure that the person’s goals are consistent with and support the priorities and strategy of the business. However according to the Society for Human Resource Management (SHRM), to ensure understanding and commitment from both sides the process must remain participative – in other words, both the manager and individual should be involved. SHRM also recommends that staff only focus on a few major goals at a time and that goals should be SMART. Regular feedback is the linchpin of successful performance appraisal, but it doesn’t always have to involve a scheduled sit-down meeting. Some of the best feedback occurs spontaneously – in the moment, on the job. What is important is that the feedback is timely and meaningful. To get the most rounded and accurate feedback on performance, it may be useful to look for sources outside of the traditional manager – employee relationship. This is where processes like 360 degree feedback have been of value. With a good understanding of how an individual is tracking against performance expectations, it should be easy to identify and prioritise education, training, or other learning opportunities that will help them achieve their goals. Development activities may involve formal accreditation eg degrees, diplomas and certificates, or could include more flexible or low cost options like eLearning, research projects, one on one coaching, shadowing, and peer collaboration. After 6 or 12 months, managers may schedule a formal review to look back, assess and document what has been achieved against specific performance requirements and goals. A formal review process is particularly important for organisations that have a reward process based on performance. Reward can take the form of salary increases, bonus payments and other monetary incentives however it can also take the form of non-financial rewards including awards, enhanced decision making, more interesting work and promotional opportunities. 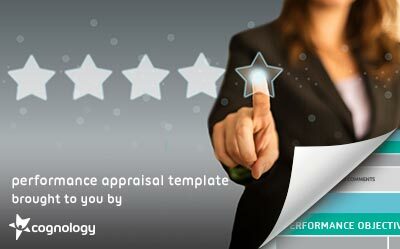 Take a quick look at our free printable performance appraisal template with practical tips for driving performance. Traditional performance appraisal processes have not always achieved the right balance between assessment and development or have struggled to satisfy the ambitions of the individual yet work within the needs of the business. Agile Performance Management is performance appraisal designed for the modern world of work. It’s more collaborative, social, transparent and responsive to the ever changing workplace. And new research by Deloitte indicates it’s having a high impact on the businesses adopting it. In fact, 90 percent of companies that have redesigned performance management see direct improvements in engagement, 96 percent say the processes are simpler, and 83 percent say they see the quality of conversations between employees and managers is going up. For more on this exciting development in performance, read Cognology’s Ultimate Guide To Agile Performance Management. With Cognology’s Performance Appraisal System you’ll get a library of competencies to make goal setting easier. In this article you’ll find an easy to understand explanation of Agile Performance Management and its benefits. But before we jump in, let’s understand why Agile Performance Management is needed.